Pebble already had a hit on its hands with the unveiling of the Time, its next-generation color smartwatch. But it was the introduction of the Time Steel a week later that propelled its crowdfunding campaign to the top of the charts, making it the most-funded Kickstarter campaign to date. And it's no wonder: The Steel has a much more premium design, with an all-metal build that comes in silver, black and gold finishes. I've had a chance to play around with the new Time Steel, and while I think it's an improvement over its plastic predecessor, its $249 asking price is still a little too rich for my blood. 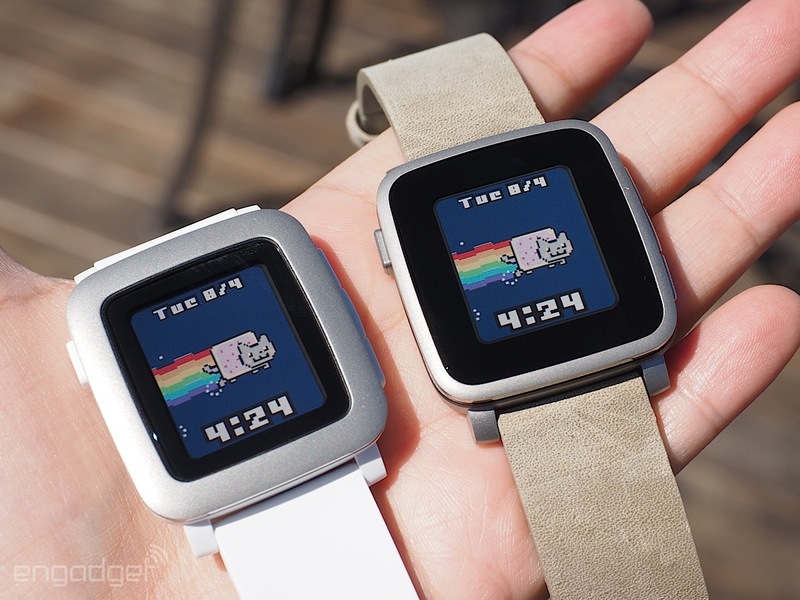 Just as last year's Pebble Steel was a sleeker version of the original Pebble, so it goes with the Time and Time Steel. While the Time might seem a little toy-like with its polycarbonate shell and silicone bands, the Time Steel's stainless steel housing and leather straps make it look more grown-up. It still falls short of being a luxurious fashion-forward timepiece, but the design is simple and discreet enough that it won't look out of place at a fancy dinner party. The most obvious design difference is the Time Steel's watch face. While the plastic model has a rather thick stainless steel border, the Time Steel has a really skinny one -- almost half the width, in fact. As a result, the black bezel surrounding the watch's 1.25-inch display is amplified. This gives the Time Steel the illusion of a larger display, especially if you opt for a watch face with a black background. Of course, I would've liked a thinner border and more usable screen space, but as most Pebble apps are made for that screen size, it's a conceit I'm willing to forgive. Aside from just looks, the Time Steel also feels nicer; I definitely prefer the sensation of metal and leather on my skin rather than the Time's plastic and silicone. The housing is a hair (1mm) thicker than the Time, but that's okay; that extra thickness actually contributes to the premium feel. 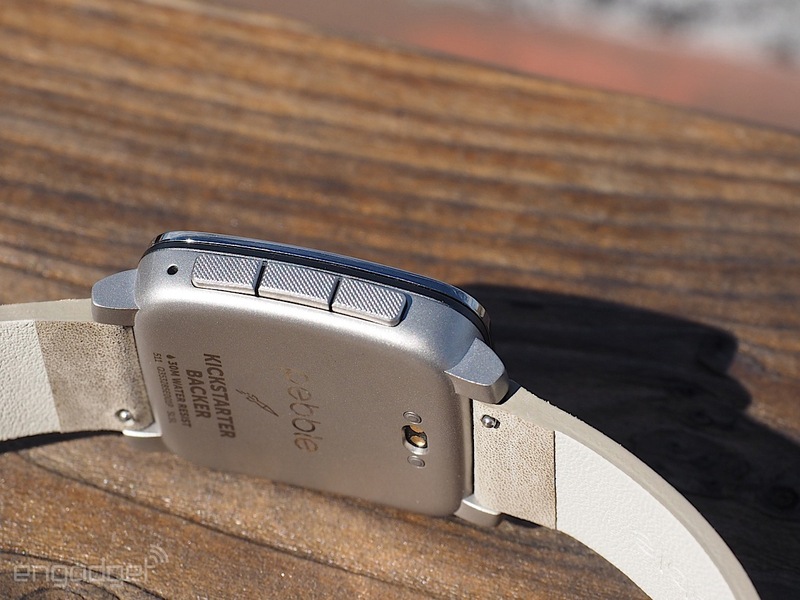 As on the Time, the underside has a slight bend to match the curvature of the wrist. Even the metal buttons feel better, complete with a textured surface that adds to the watch's finesse. While the Time's plastic buttons felt a bit squishy when pressed, the ones on the Time Steel are easier to push down, with a more satisfying click. In addition to leather, the Time Steel also comes with a metal link bracelet, but as of this writing it was unavailable. 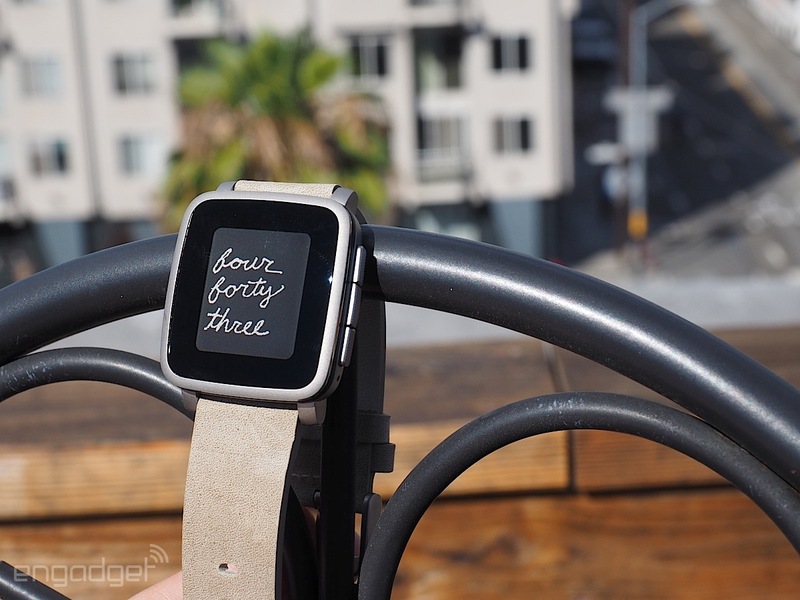 Pebble apparently experienced an "availability issue" with them and will deliver the metal bracelets to Kickstarter backers in a later shipment. It's worth noting, however, that while Kickstarter backers of the Time Steel will get both leather and metal straps for $249, retail customers will only be able to get the leather version for the same price. In retail, the metal bracelet will be sold as a separate accessory for $50 more. As for the rest of the Time Steel, well, it's the same as with the Time. The color e-paper display appears lackluster compared to brighter OLED panels -- although you can turn the backlight on in low light -- but it outperforms the latter under direct sunlight. E-paper also offers a couple of other advantages: The time is always on without having to flick your wrist, and the battery life is outstanding. In fact, the Time Steel promises up to 10 days of use instead of the Time's seven (perhaps that's why it's 1mm thicker). Like the Time, he underside of the Steel includes a couple of metal pins that work as either charging connectors or a smart accessory port for upcoming "smartstraps" that add extra features like GPS and NFC. The watch is also water-resistant up to 30 meters; has a microphone for voice commands; and is compatible with any standard 22mm strap. And of course, it also has that new Timeline software that lets you navigate through notifications, events, news and reminders in chronological order. In sum, the Pebble Time Steel is a clear upgrade over the Time with its higher-end materials, refined design and longer battery life. But I'm still struggling with its $249 price point, especially as it won't include the metal link bracelet when it comes to retail. For about $100 more, you could get either the LG Watch Urbane or an entry-level Apple Watch, both of which are considerably more stylish and functional. For $200, you could get a nice ASUS ZenWatch and last year's Moto 360 is practically a steal at $150. I thought the Time was expensive at $199 and I definitely think the Time Steel is overpriced at $249, especially compared to its rivals.